With the last posting (directly below this one) I promised a return with evidence that like this year’s spring, so this fall is late by a few days. 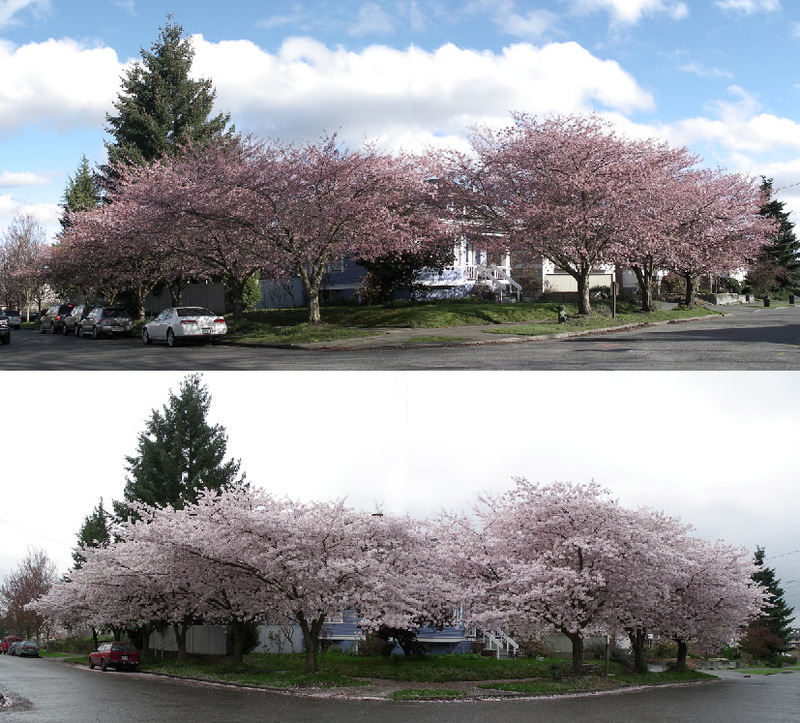 The comparison below of the blossomed cherry trees at the southeast corner of 46th and Corliss were taken one year apart. The top of the two on March 27, 2008 and the bottom of the two one year earlier, where the budding is further along and the petals are dropping. This flowering comparison is followed by another from Sept 27, 2008 (on the top of the bottom two) and at the bottom, one year earlier. 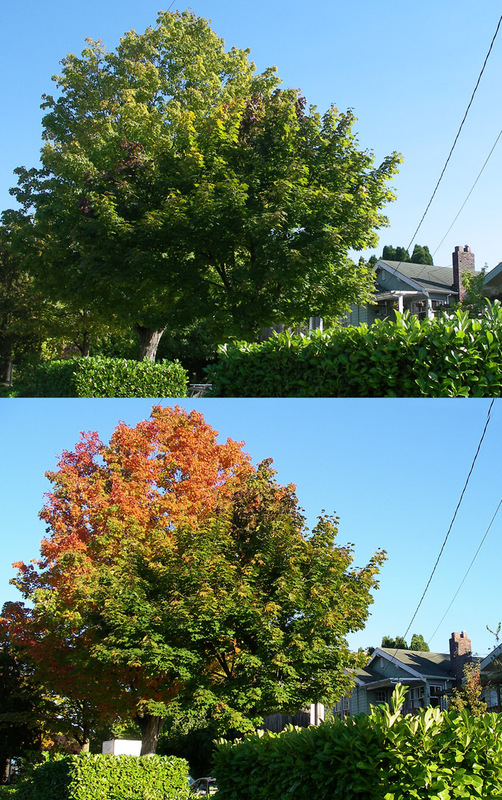 The difference here is subtler than with the blossoms, but real enough in the reds of the turning leaves. 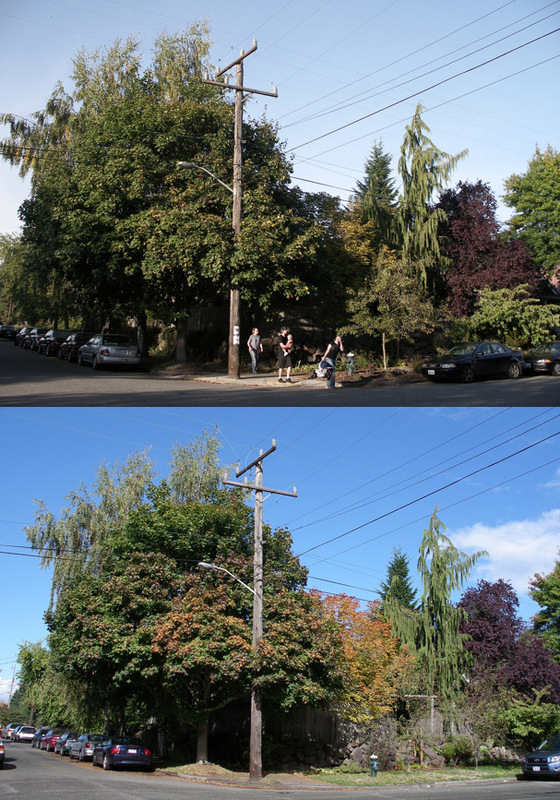 I will not name the types of several trees that appear there at the northeast corner of 46th and Burke in hopes that a reader will respond with their names. Another reason is that I don’t myself known the names. So, if you can, please help both nature and me. One day more and I returned to the northeast corner of 44th Street and Wallingford Avenue to repeat a tree I first notice many years ago for its brilliant fall color. I tagged it the “Flame Tree.” However, today, Monday Sept. 29, 2008, it was still in the summer greens seen here direclty below. Below it and two years ago, on Sept. 27, 2006, the Flame Tree was far into its fire.